Presenting the very best in groundbreaking films by or about women from around the world. TWE films entertain and enlighten. Enjoy films highlighting filmmakers and issues which rarely appear in mainstream theaters - films which use storytelling to give voice and create change. Buy a TWE ticket, invite a friend, and enjoy some great films that not only educate, but inspire! Ticket Packages are sold out! JOIN US FOR OUR FABULOUS FILMMAKERS RECEPTION! Saturday, April 6, from 5:30-7:30 p.m. at the Sarasota City Center, 1819 Main Street, Sarasota. A warm thank you to Dilweg Companies for sponsoring this evening hosting our filmmakers. Also, we wanted to thank Bart Lowther and Stephen Fancher for providing music for this event. Tickets are $75 and available at throughwomenseyes.com. Individual movie tickets may be purchased after March 30 ONLY at the SFF box office or online at www.sarasotafilmfestival.com. Student/Educator Tickets – $10.00, with appropriate ID. GCC and TWE are all-volunteer organizations that support the valuable work of UN Women. Proceeds from our events support UN Women programs. If you cannot attend TWE this year, but would like to be with us in spirit, consider making a donation to our organization! TWE Filmgoers will remember the unforgettable documentary On Her Shoulders, which we screened at the our festival last April in Sarasota. 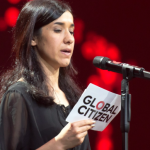 This powerful film tells the story of Nadia Murad, a Yazidi woman abducted by the Islamic State. This year, Murad was honored with the Nobel Peace Prize. In RBG, U.S. Supreme Court Justice Ruth Bader Ginsburg is an extraordinary legal legend and a feminist “pop culture icon.” The film explores the life of the “notorious RBG” from an early age, through college and law school, meeting the love of her life, and culminating with her years on the Supreme Court. Through Women's Eyes Film Festival Announces a Fantastic Movie Lineup! SARASOTA, FL - From powerlifting to power building, the films at Sarasota's TWE International Film Festival have told heroic stories of the transformational power of defying the odds. The 19th Annual Through Women's Eyes International Film Festival (TWE) was Saturday, April 1, and Sunday, April 2, at Regal Hollywood Stadium 20, 1993 Main St., Sarasota. Every year, TWE presents the very best in new, groundbreaking films by established and emerging filmmakers from around the world. We chose 22 films (15 shorts and seven features) from more than 300 submissions. We had record-breaking attendance and a full house, with tickets sold out well before the event. The film, "RBG" (about Ruth Bader Ginsburg) received the Audience Award at our festival and then went on to well-received showings around the world, notably on CNN. A Review: 2017 Through Women's Eyes International Film Festival! We are celebrating! Our donation to USNC and UN Women will be the largest yet. This was made possible by increased attendance and by the wonderful work of our tireless volunteers. TWE and Chapter volunteers welcomed viewers to the very best in new, groundbreaking films produced by established and emerging female filmmakers from around the world. This year we enjoyed 22 films (15 shorts and seven features) selected from more than 300 worldwide submissions. The momentum continued throughout the weekend, with over 120 people attending our Filmmaker's Reception, meeting filmmakers, and enjoying great food and companionship with TWE attendees. Watchers gave TWE high marks indeed! All of our full length features received an audience rating of at least 4.5 out of 5.0! Three of our full length films were in the running for the SFF audience award. Finally, we extend deep thanks to TWE Artistic Director Ann Fries for her unfailing dedication for the past seven years. No one has been more instrumental than Ann in selecting the films that draw and enthrall our generous audiences. She has been the face and voice of TWE, tirelessly speaking to the press and local organizations about the wonderful filmmakers and films featured in TWE each year. Thank you, Annie, for your vision, leadership, and commitment. While Ann is retiring from TWE, she will continue to support the valuable work of UN Women and remain on our Chapter Board. Check out the film lineup!